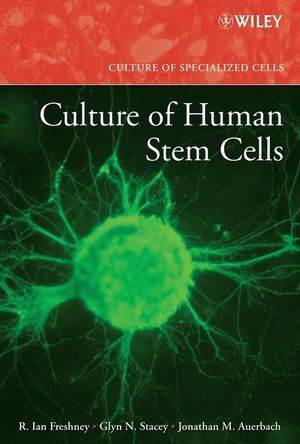 This book collects the most effective and cutting-edge methods and protocols for deriving and culturing human embryonic and adult stem cells—in one handy resource. This groundbreaking book follows the tradition of previous books in the Culture of Specialized Cells Series—each methods and protocols chapter is laid out exactly like the next, with stepwise protocols, preceded by specific requirements for that protocol, and a concise discussion of methods illustrated by data. The editors describe a limited number of representative techniques across a wide spectrum of stem cells from embryonic, newborn, and adult tissue, yielding an all-encompassing and versatile guide to the field of stem cell biology and culture. The book includes a comprehensive list of suppliers for all equipment used in the protocols presented, with websites available in an appendix. Additionally, there is a chapter on quality control, and other chapters covering legal and ethical issues, cryopreservation, and feeder layer culture. This text is a one-stop resource for all researchers, clinical scientists, teachers, and students involved in this crucial area of study. R. Ian Freshney, PhD, Honorary Senior Research Fellow in the Centre for Oncology and Applied Pharmacology at the University of Glasgow, is the bestselling author of Culture of Animal Cells, which appeared in its fifth edition in 2005, and is the Series Editor for the Culture of Specialized Cells series (all published by Wiley). Glyn N. Stacey, PhD, is Director of the United Kingdom Stem Cell Bank, and Head of the Cell Biology and Imaging Division at the National Institute for Biological Standards and Control. Dr. Stacey is internationally known and a sought-after speaker on safety and quality control issues in the use of stem cells. Jonathan M. Auerbach, PhD, previously director of the Stem Cell Center, American Type Culture Collection, in Manassas, Virginia, is now a Project Leader with GlobalStem, Inc., in Rockville, Maryland, and has been at the forefront of human stem cell research for many years. 1. Quality Control Procedures for Stem Cell Lines (Glyn N. Stacey and Jonathan M. Auerbach). 2. Human Embryonal Stem Cell Lines: Derivation and Culture (Jessica A. Cooke and Stephen L. Minger). 3. Techniques for Neural Differentiation of Human EC and ES Cells (Jamie P Jackson, Peter D Tonge and Peter W Andrews). 4. Cardiomyocyte Differentiation in Human ES Cells (Christine Mummery). 5. Culture of the Human Germ Cell Lineage (Lee Turnpenny and Neil A Hanley). 6. Derivation and Culture of Human Embryonal Carcinoma Stem Cell Lines (Stefan Przyborski). 7. Culture of Umbilical Cord- and Cord Blood-Derived Stem Cells (Young-Jin Kim). 8. Multipotent Stem Cells in Dental Pulp (Wataru Sonoyama, Takayoshi Yamaza, Stan Gronthos, and Songtao Shi). 9. Fundamentals of Culture and Characterization of Mesenchymal Stem/Progenitor Cells (MSCs) from Bone Marrow Stroma (Carl A. Gregory and Darwin J. Prockop). 10. Isolation, Characterization, and Culture of Soft Connective Tissue Stem/Progenitor Cells (Charles W Archer, Sarah Oldfield, Samantha Redman, Laura Haughton, Gary Dowthwaite, Ilyas Khan and Jim Ralphs). 11. Culture of Human Corneal Stem Cells (Yiqin Du and James L. Funderburgh). 12. Culturing Mammary Stem Cells (Mark A. LaBarge, Ole W. Petersen, and Mina J. Bissell). 13. Tissue Culture of Adipose-Derived Stem Cells (Kristine M. Safford and Henry E. Rice).